Not sure if anyone has tried this but I used the calculator last night on my s7 edge UK, tried 55-20%.....it came back repeatedly with 54.8! 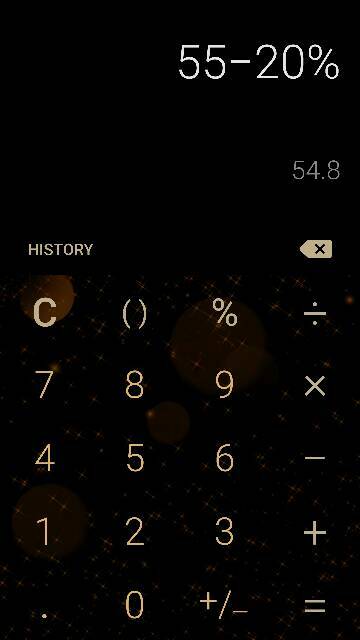 I know new phones have bugs but jeez, the damn calculator? Something I use daily. I've also had an issue where the music audio became distorted and quiet. Idiopathically resolved after 12 hours. Bizarre. Anyways does anyone else have a wonky Samsung calculator? Maybe you accidentally did 55 - .20? It does the same on my S7 and S7 edge. It is not right. On my Galaxy Core Prime and pc calculator I get the right answer. I think it's a math/order of operations issue (the calculator is correct). If my students wrote 55 - 20% I would ask 55 - (20 percent of WHAT)? What you want to do is 55 times 80%. Now the other calculators, while mathematically incorrect, are skirting the rules with the intent that it assumes it knows what your are trying to do. ahh 20% of the first number, ?? How are you with audio problems on the gs7 lol? I discovered the same problem with my S7 just a few hours ago. I've been able to perform subtraction using percentage calculations on my previous phones and pocket calculators for years. Now they change? And with no notice? Right or wrong, it was a stupid idea to change the format. I was wondering what was going on since almost all the other calculators I've used in the past how many years would compute 55 - 20% and come up with 44. Glad it's not broken, just working mathematically correct. Haha. Yeah it's correct. In the future type: 100-10%(100) for the right answer. 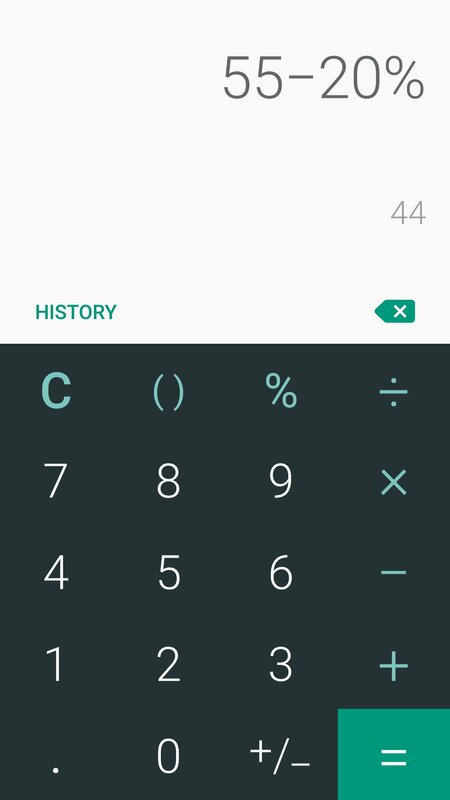 There is an update for the calculator app in the Samsung Galaxy Apps store. It changes it back to the way that it used to be. Yes. The same happened with me when i updated my note 5 to android6. And unfortunately the same error is there in my new s7edge also. What calculators have you been using? I've been using calculators (actual scientific calculators by Casio or Sharp or Panasonic) in school since elementary (I'm 29 now) and they all work like how the S7 does? Or just say, in your head, what percentage you're trying to calculate and then multiply the decimal (X%/100) by the number? Did people really get this intellectually lazy since I was in school? Surely you can do 100 - X, in your head? Right? My samsung S7 cal. Works fine with for a while an then after sometime it automatically underline the entered operand and hence you cannot apply any operator.......... solve as soon as possible ! How do I take slow motion videos with the Nexus 6P? Why did my installed apps on mobile device now say not installed and replaced with the Android pic?